DESCRIPTION Modern Elegance in the heart of Rosscarrock. Truly two of the best homes in the area, featuring an abundance of estate quality finishing at excellent value!Over 3100 square feet of living space adored with custom cabinetry, hardwood flooring, quartz counters, and all the expected upgrades already in-house.The main level boasts a huge living/dining room area. A chef's kitchen with stainless steel appliances, and an amazing Island, perfect for those casual parties.The large family room off the kitchen enhances the open plan of the main level, further opening up to the large patio.The upper level features an amazing master, with fireplace,boutique bathroom and walk in closet.The additional bedrooms are privately located and are spacious and bright.The lower level media/games room has a large bar, additional bedroom and full bath. A double detached garage and an amazing location steps to the LRT 17th ave, Parks, and all the best inner-city amenities. Too many features to list! These homes will not disappoint. Home for sale at 1606 42 ST Sw Calgary, Alberts T3C 1Z5. 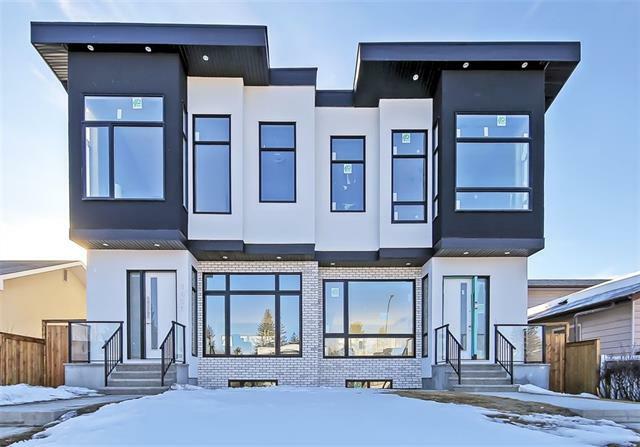 Description: The home at 1606 42 ST Sw Calgary, Alberta T3C 1Z5 with the MLS® Number C4222793 is currently listed at $849,500.